I need to enable google+ api, so I need the debug.keystore. I switched to Android Studio and do not know where it is. 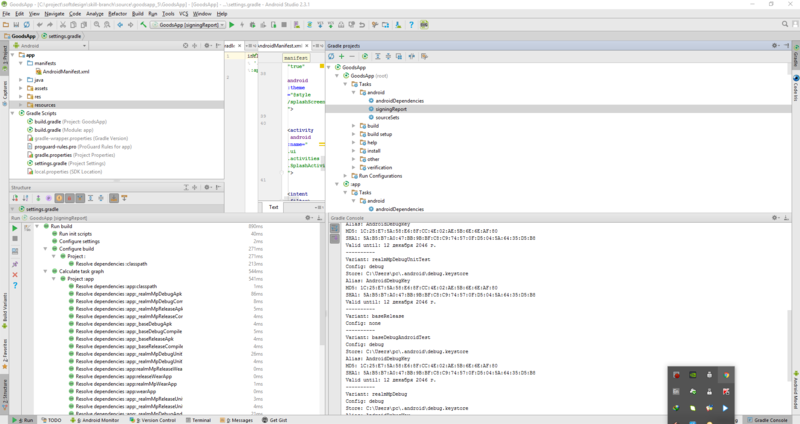 I can find it in eclipse at path ~/.android/debug.keystore. EDIT Step 1) Go to File > Project Structure > select project > go to "signing" and select your default or any keystore you want and fill all the details. In case you are not able to fill the details, hit the green '+' button. I've highlighted in the screenshot. 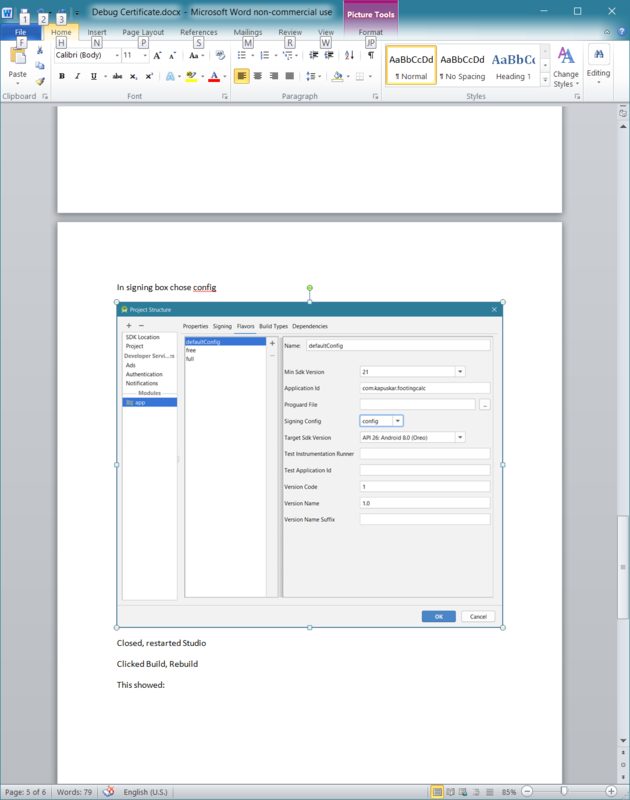 Step 2) VERY IMPORTANT: Goto Build Types> select your build type and select your "Signing Config". In my case, I've to select "config". Check the highlighted region. 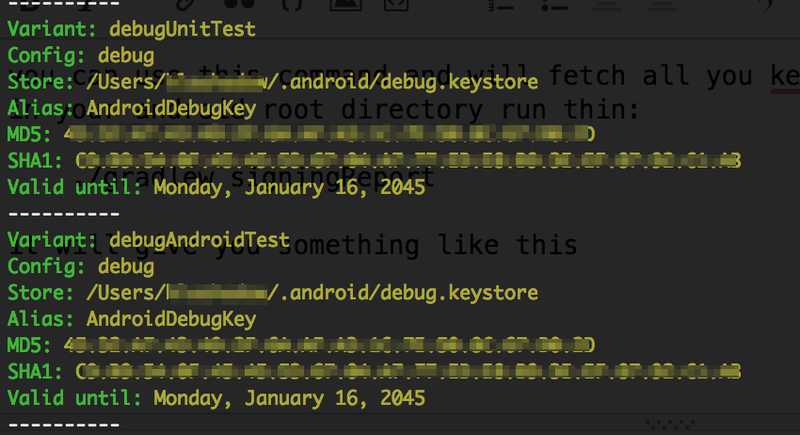 from the command you can easily see that keystore address is "c:\users/<%mylogin%>.android\debug.keystore" , alias is "androiddebugkey" store password is "android" key password is "android"
Run signingReport task (double click) and you will see the result in Gradle console (keystore paths,SHA1,MD5 and so on). I got this problem. The debug.keystore file was missing. So the only step that created a correct file for me was creating a new Android project in Android Studio. 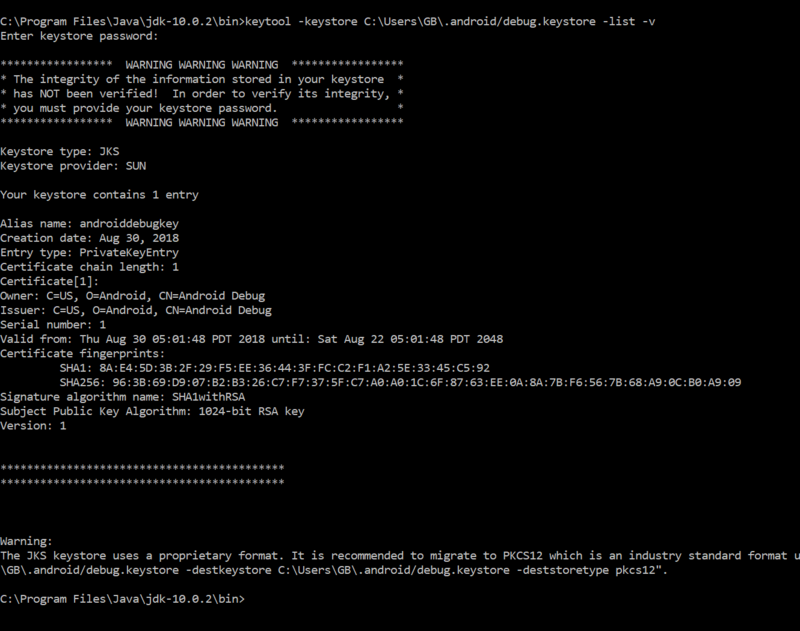 It created me a new debug.keystore under path C:\Users\username\.android\. This solution probably works only when you have not created any projects yet. All you need to do is goto command prompt and cd C:\Program Files\Java\jdk-10.0.2\bin>where jdk-10.0.2 or full path can be different in your case. once you are in the bin, enter this code keytool -keystore C:\Users\GB\.android/debug.keystore -list -v where C:\Users\GB\.android/debug.keystore is path to keystore in my case. You will get results like this. 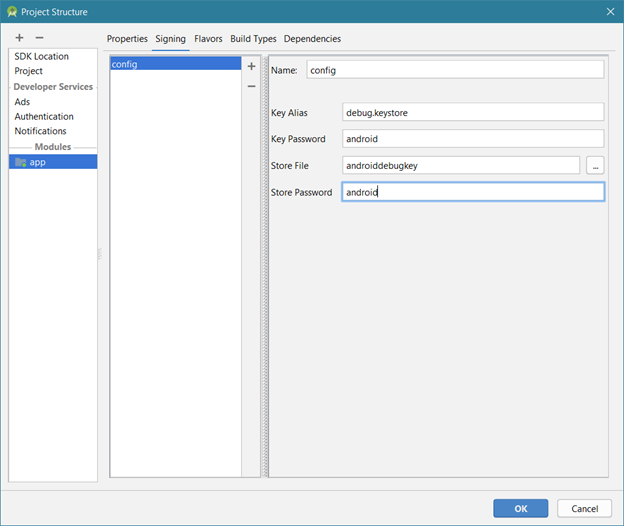 On Windows, if the debug.keystore file is not in the location (C:\Users\username\.android), the debug.keystore file may also be found in the location where you have installed Android Studio. The easiest thing I can think of is to grab the fingerprint from the debug.keystore (paths are mentioned in other answers) and add that to your project. No need to copy keystores or add new apps. Just append to the list of fingerprints for each machine you develop on. FWIW, I ran into this when I switched from one laptop to another. I bounce around a lot. The default keystore file: debug.keystore is present in the folder .android which is usually located in the default home folder of your operating system of the user who installed that Android SDK. When I tested the app on a cell phone, Studio asked to reinstall the app with this new configuration. App runs as before! Not the answer you're looking for? Browse other questions tagged android keystore android-studio or ask your own question. 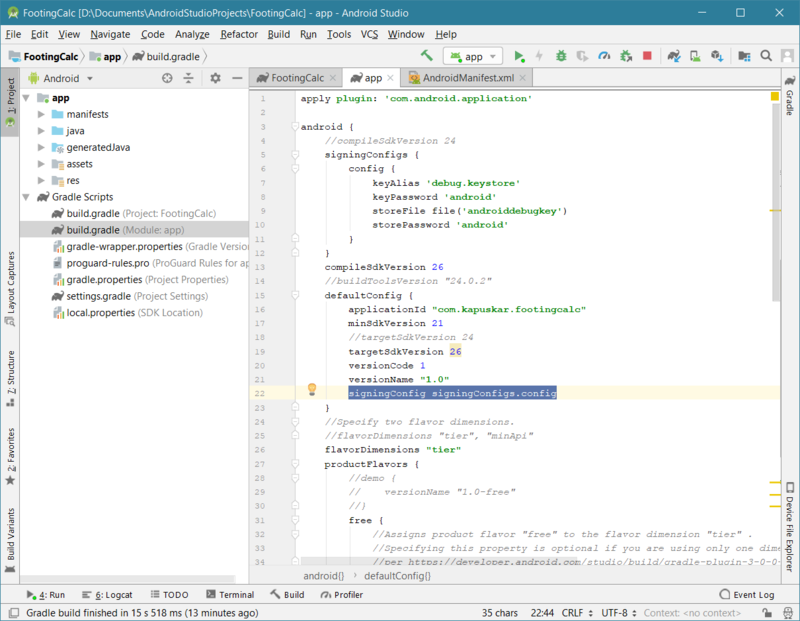 What is the equivalent of Eclipse “Custom debug Keystore” in Android studio? 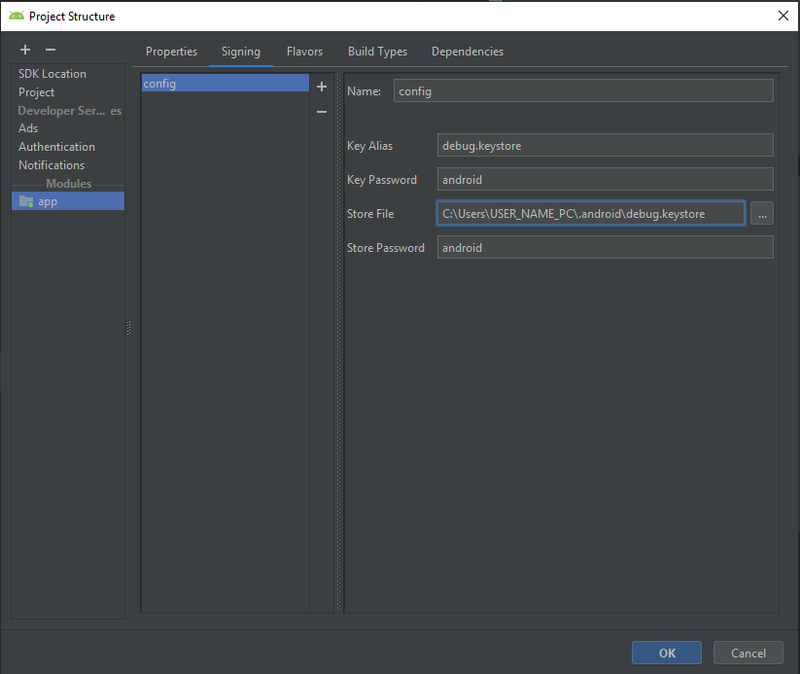 How to get the SHA-1 fingerprint certificate in Android Studio for debug mode?